is a lovely assembly of five galaxies of varied shapes and colors. Starting at 10 o'clock is the group's namesake NGC 691, an SA(rs)bc spiral discovered by William Herschel in 1786. At 11 o'clock, is S-shaped IC 167. In the upper-right corner is NGC 697, and at 7 o'clock is the golden edge-on NGC 678. Immediately above it is elliptical NGC 680. 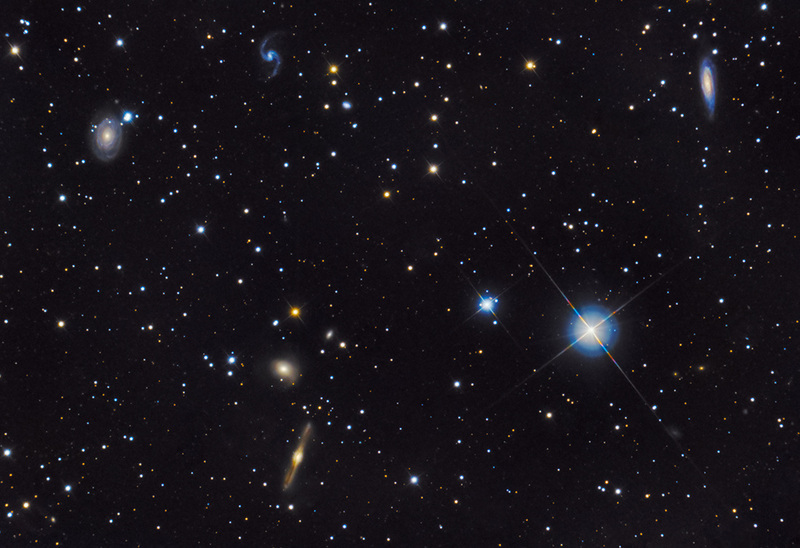 Look a bit closer, and you will also spy two tiny lenticular galaxies in the field- NGC 694 and IC 1730. The group's distance from Earth is approximately 130,000,000 light years.